Will Tiki Towers build Wiiware to new heights or crash under its own weight? Some might see this jungle themed construction game as a bit of a cash in on the success of World of Goo. After all, both games command you to get from point A to point B by building a structure. However, this is where the similarities end. For starters, the structures are more conventional here and resemble traditional architecture,, albeit in a simplified form. There are no wacky triangle-shaped goo bridges with balloons to hold them up, just traditional girders made of bamboo to place into a shape of your own design with the help of your team of monkey engineers. Their job is to carry out your orders by placing bamboo pieces, stabilizing them with knots made of vines, and carrying out other odd jobs, including conjuring "Bananamana". Some of the differences between Tiki Towers and World of Goo are subtle. What’s the difference between a goo tower and a bamboo tower, after all? Well, a lot of the difference is in the physics engine. World of Goo's building medium is very bouncy – you must constantly fight gravity as your gooey structures sway left and right. Tiki Towers' bamboo is affected by gravity too, but the challenge is to create a stable structure. If too much stress is put on a piece, it can break, potentially causing other pieces to break in a cascading effect. In both games, your job is to build a stable structure, but the tools you have to work with are what really set the two games apart. 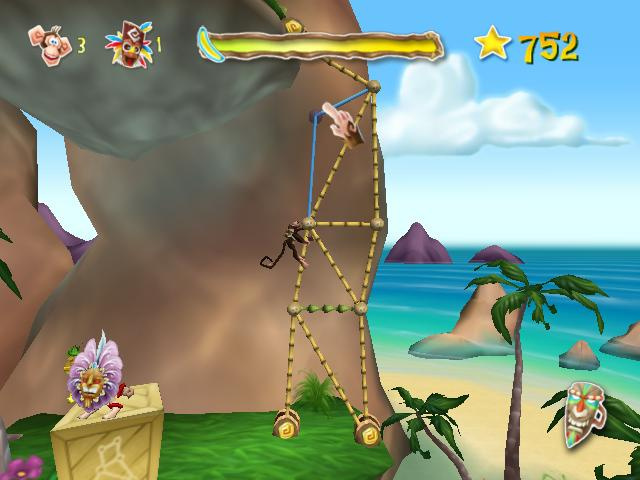 Your primary tool in Tiki Towers is your team of monkeys. You do all the hard work of designing your tower by clicking and dragging, but the monkeys do the easy work of running back and forth for supplies and building it. You don’t have to tell them what to do -- just lay out your blueprint and the monkeys will go to work automatically. This system sometimes requires you to wait for your monkeys to move back and forth, and monkey management can become a part of the strategy as you don’t want to let those lazy monkeys go all the way back to the resting area while you’re plotting your next piece to lay or you’ll waste time waiting for them to come back. An additional benefit your monkeys can bring you is "Bananamana". This is accomplished by simply clicking on the icon on the top left to assign as many monkeys as you want to this task. The more monkeys you assign, the faster you’ll gather. But this of course means you’ll have fewer monkeys assigned to build. Since your score is determined by how fast you get through a level, you’ll want to think carefully about how many monkeys you assign to each task. Don’t skimp on Bananamana entirely, because it allows you to purchase other items that you need to survive. Some are superior construction materials such as Iron bamboo, which will help you build a more stable foundation and can be critical to the building of larger, more complex structures that are less prone to breaking. Others are defensive items that will protect you from attack. 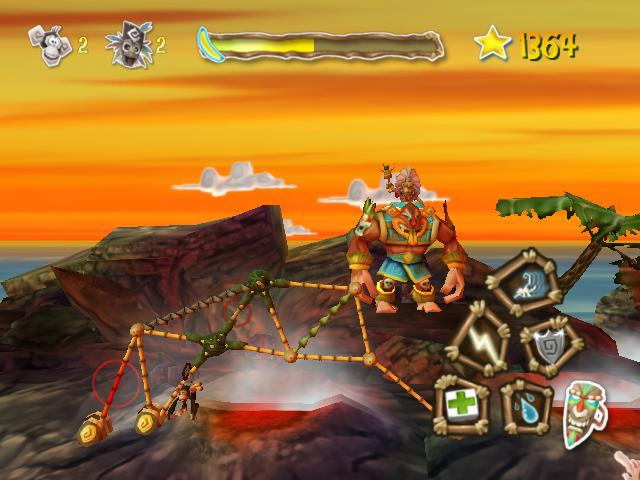 The story of Tiki Towers is that you are leading a band of good monkeys in their quest to conquer five islands from some evil monkeys. The reason these monkeys are the villains and you are the good guy is because you want to conquer their islands and leave them homeless. In each level, these evil monkeys will throw obstacles in your way with effects ranging from weakening your bamboo to casting fire at your structure. You’ll need to rely on your special items (paid for with Bananamana) and your architectural soundness to survive these attacks. 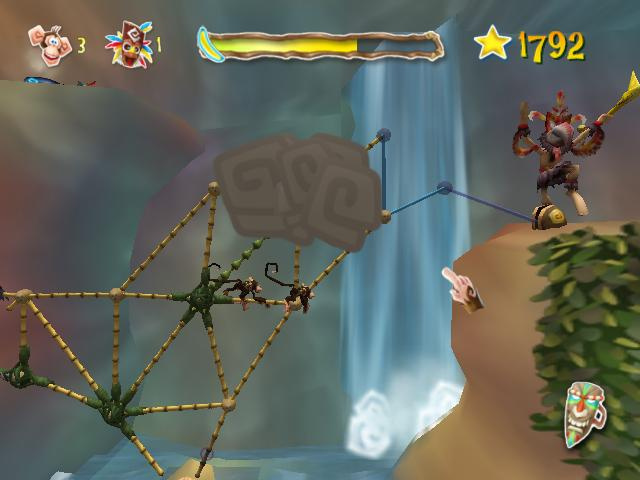 You don’t actually fight the evil monkeys, but they are a welcome obstacle to keep the game exciting as you build. The game is a good length for its price. 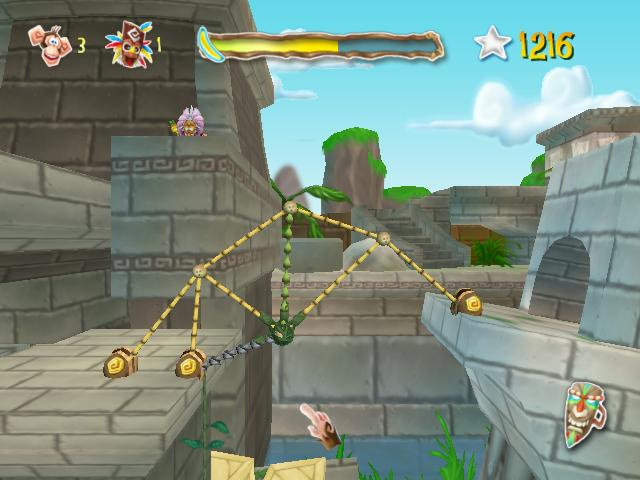 There are five islands with four levels apiece, but each individual level can take a very long time. Perhaps too long, as by the time you reach the second island you will be building multiple structures in multiple directions to find hidden items, go around obstacles, and eventually reach the exit. These levels can take an hour or more to complete and stand in stark contrast to the short few minutes that World of Goo levels typically take. Part of the reason for this is the comparatively large levels, but a bigger reason is the slow pace. Your monkeys simply take a lot longer to work and don’t move around as fast as goo. This resultantly longer, slower game is just a design difference and not really a problem. But what can make it a problem is that there is no way to save your progress in the middle of a level. If you’ve been playing for an hour and suddenly have to leave, all of your progress on the current level will be lost. This means that unlike most Wii games that encourage short term pick up and play attitudes, for Tiki Towers you’ll have to schedule time to play if you want to be sure you’ll have time to finish even one level. The game has a multiplayer option, but it is really nothing to write home about. Instead of racing one another on the same level or in split screen, it is simply a co-op mode where cooperation here means you simply relinquish your Bananamana control to player 2. This is kind of fun and certainly worthy of inclusion, but it is not as satisfying as a full competitive multiplayer mode would have been. 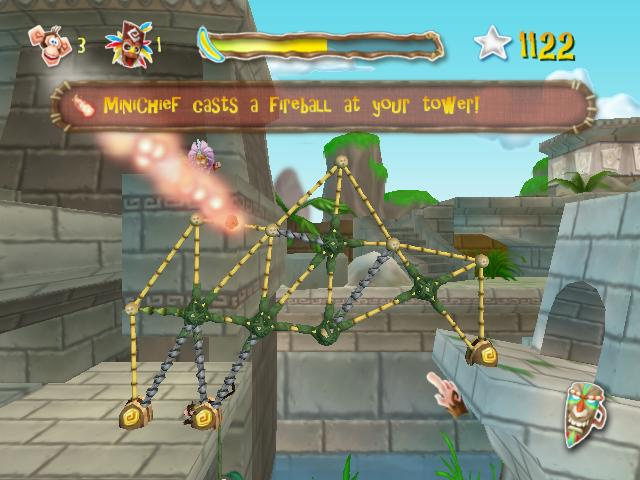 Detractors have criticized the graphics in Tiki Towers, but they are not so bad as to diminish the experience. However, World of Goo clearly wins out in this department: we suspect the lower quality in graphics has something to do with the lower price tag, so at least the developers are passing the savings on to you. And really, games of this genre are more about the gameplay than about the visuals. A more legitimate complaint with the visuals would be that the maps are so large that it can be difficult to find where a problem is occurring. Sure you are alerted that your tower is under attack with audio clues, but which tower? You may waste time hunting for the problem area when a small map with warning icons in one of the corners could have made things easier. But this is a small nitpick that does not detract from what is otherwise a solid gameplay experience. 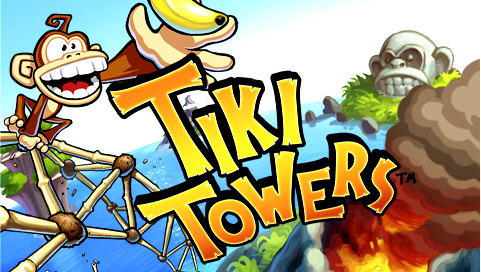 Tiki Towers is not going to win any awards like World of Goo, but at a third of the price it is still well worth a look. Tiki’s world of bamboo makes for an entertaining game with bags of personality. Some of the later levels will take quite some time to solve so there is easily enough gameplay on offer here. The Bananamana system adds an extra bit of depth as you’ll need to be careful to achieve gold stars on some of the more demanding levels. Why not take a chance and monkey about with Tiki Towers? At just 500 Wii points, what have you got to lose? I was guessing a 7 also, as it looks like a pretty good game! I've seen videos of it and I didn't expect a seven... Well, maybe i get this. The lower price tag is that it is more like $1 on the iphone but I guess 500 wii points is the cheapest Nintendo will allow. I was worried the slow pace of the game would be much more of an issue. From the sounds of things it is the biggest issue the game has. I'll definitely give this a shot when it arrives in Europe - I can't say I was expecting less that a seven though after reading comments recently posted here, so that's good. @Starwolf: 500 Wii Points is the minimum price for WiiWare games, sadly. The only way to get around this was to release some form of free pack with cheaper DLC-based games, if you see where I'm coming from. Damn RealArcade!!! Where's my free copy!? @chunky_droid: Damn, chunky!!! Where's your little $5 bill?! I mean, seriously? Give up that next trip to Wendy's and pick up Tiki Towers, for crying out loud. Yeeeeesh. No need to be a cheapskate just because you missed out on a promotional offer. That really stinks for you chunky_droid...but the good thing is that it's only 500 points if you still want it. I been able to put a few hours into the game and I can say I am pretty impressed and its a good game for 500 points. The visuals are decent and colorful. They kinda make you wish Donkey and Diddy Kong would show up in the game. The sound is pretty good too. There is no in-game music, but I enjoyed hearing crashing waves or raging waterfall with all of the jungle sound effects. The vodoo cheifs voice gets annoying though. The whole point of the game is to build flimsy bamboo structures to get from point A to B and it works pretty well. The game has a funny sense of humor. I had a few "happy accidents" that led to the demise of some of my worker monkeys. I did not know monkeys could not swim, but I do now! Its a lesson I need to know. Overall I think 7/10 is a good score and this game is probably worth a look if you enjoy World of Goo. Sounds like this one is closer to the Bridge Builder experience. @Jockolantern-Chunky should get the free copy, because I did and I believe I responded to RealArcade later than Chunky. I didn't read a 7s worth of fun in that review. The praise was hardly glowing . . . it was vague and generic. Also, most of the people who've posted positive comments about this game here have received it for free. I am chin-rubbingly suspicious that this is really a 5-6 game, but Mr.McIlvaine saw what his 6 did to Fun! Fun! Minigolf here, and gave Tiki Towers an extra pity point, in order to save it from the same fate. I don't blame him . . . it's a humane and generous thing to do, 'specially at Christmas. When I think of all of the developers' of Tiki Tower's kids goin' hungry this holiday season, my lips get a little trembly. Be that as it may, I certainly shant be stopping by Tiki Towers, Mudflap Gardens, OR Overlook Overlook this holiday season. "Deck the halls with jowls of holly, fa-la-la-la-lah . . . . la-la-la-lah . . . "
Poor chunky...I'd have given the game an 8, but I think that might be slightly biased from only playing the first world so far (not been feeling well) and that I got it for free. So 7/10 seems pretty fair. Nice review. EDIT: I really enjoyed the first world, but lost interest in the 2nd one. Wait, wait... Free copy? Did I miss something? And why does this game not have a quick-save feature for the long levels? I ask you, oh developers of this game. As usual, some of my more questionable 'humor' didn't make it past editing. But if it was lost on the cutting room floor, then let me add now that I had a lot of fun with this game. It's nice to hear that there is another good WiiWare game out. I have World of Goo and I am not going to buy this because I have my eye on some future releases. Whoo... This did not whomp. @Draygone: That's what I'm wondering. What's with the free copies. I want one! lol. Otherwise, I'm not bothering. How are you guys getting free copies? Also, I wanted to message RealArcade with a game I hope hits WiiWare. Anyway I can contact them? Sounds like a pretty good game, I expected it to get a 6. I don't think I'll get it though, WoG will keep me occupied for structure building and there's a few other WiiWare games I might get. I got this game for free and it is good. Worth $5 any day. RealArcade posted a few ads in the comments section that they were giving this game away for free as a contest. You had to send an email to tikitowers@real.com telling them your Wii Number. If you entered early enough you would get an email saying RealArcade's Wii Number. If you set your Wii to get gifts you would have gotten it the day it came out. They still haven't deleted my Wii Number so I send them messages about what I think of the game. Great review Spencer! I agree, the game isn't up to World of Goo standards, but at 500 Points, it's difficult to fault the game. The building process is just a lot more in-depth and requires you to plan each individual move very carefully. I'm going to try to play it some more later in the week since I was only able to play through about 6 levels. Was there any mention of RealArcade's free game on this site? The game is definitely worth the 500 points but I don't ever want to miss another free game again. Awesome review yet again, Spencer. Looks good but I`ll stick with WoG. I`m hoping for Gradius Rebirth someday...someday soon. This isn't similar to goo, so don't compare them. Meh, I'm still not interested in it, not one bit. Thank you for the review! We hope those of you who downloaded our game will enjoy it. We have gotten a lot of great comments for both the WiiWare and iPhone/mobile versions of the game. Happy Holidays from all of us at RealArcade! Well, that figures. The giveaway must've been in some topic I wasn't looking. Ah, there it is. In the interview article. Yeah, I read that to see how the guys compared it (or un-compared it) to World of Goo. But I don't tend to read comments in articles not related to what games come out or what's reviewed. What would people say about the game that's not already being said elsewhere. Well, apparently people saying that they're giving away free copies. Nice Review, but I have WoG and if I somehow got my hands on some wiipoints I'll save them for future releases. well, the price is right... but i'm seriously short on blocks. i already deleted some stuff and moved all my VC games to SD cards. i don't want to have to move wiiware too. @jockolantern: I'm not really that angry or upset or anything. I have better things to do with my time, I just felt like a new game to play and I have no points . @Chunky-Droid-Looks like as long as you tell RealArcade that you haven't recieve your gift of TT you should get it sometime this week. Hopefully sooner. Good luck to you on that. I keep checking to see if you got it yet. Wonder what happened. Why'd you set it to Canada? They get the same things the US does right? Anyway hope you had a good Christmas. I am addicted to Goo. Bambo is a lot bit harder to swallow, plus it tears up my insides, LOL! Makes me want to build sculptures out of toothpicks and gumdrops, something I haven't done since I was a kid... Anyway, I've got other games to keep me occupied over Christmas holidays, then it's back to college, again! Yeah, WOG was awesome, this cant be compared to WOG. Meh... another mediocre WiiWare title. No thanks. @ World 1-1: Mediocre is 5/10, not 7/10 . Cool! I just made my account, and this is my first comment. This seems like a decent game that I've been curious about, but I probably would like to get Goo instead of this. Indeed. Our scoring policy clearly describes a 7 as 'good' and 'recommended'. But for many people it seems anything less than a 9 is 'mediocre'. To each his own, I guess. so its basically The PSNs Elefunk then? This sounds like my kind of game. I was looking at WOG, but it like the sound of managing the load on a flimsy yet solid structure more than a wobbly bendy one. When does it come out in EU? @longtimegamer: I set it to Canada as that's where I got my Wii from, but anyway, I got gifted! Yeehaw! When I was a young lad we had something called 'Odyssey of the Mind'. I still recall competing to build the longest suspension bridge made entirely out of straws. So I'm actually a bit partial to this over WOG because it feels a bit more 'real'. the game is great, even if is not WoG, there can be other games out there you know. 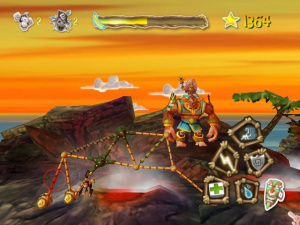 This is currently £0.59 on the App Store, for iPhone and iPod touch. The only difference is that it's in 2D. Bargain! Downloaded it last night at around 11:30 p.m.... and ended up playing until 1 a.m. It really is a fun game that can't be argued with at a 500 Wii points price tag. Bamboo physics do have to be taken into consideration since the towers tend to break due to gravity and lack of structural support so those that purchased World of Goo will need to re-adjust their design techniques. Gold Star on 6 levels (the boss level was hard since him turning one bamboo into rubber can completely destroy a tower when your monkeys are making their way into another section of the level) and will definitely continue playing until the end since it provides great fun... and I also need to finish it to make room for the Mission Packs for Space Invaders Get Even. 4/10. i only played for around 40 minutes before i stopped. bottom line. the fire balls are just plain annoying. and there's no incentive to keep playing. buttle, you're supposed to set 1-2 monkeys to Bananamana production so you can use the rain to get rid of the fire or use the reinforce spell to get rid of the rubber ones. Halfway done with the game. Seems like I'll finish it in a week or so. Glad some people are enjoying this game. @RealArcade: PLEASE! I really hope you can bring Turtle Bay and 3D Hamsterball to WiiWare. That would please me to no end. They have a soft spot in my heart. I downloaded World of Goo and completed it first then I Downloaded this one and completed it.I think this one is a better value and fits a broader age range then World of Goo.However,I enjoyed both of them.